Need a new durable backpack? Get the Fjallraven Kanken backpack from Sweden! 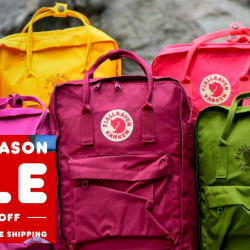 The colourful roomy backpacks are on sale at up to 40% off at My Kanken Bag's End of Season Sale with worldwide free shipping! The Fjallraven Mini Kanken is also great for your kids for school so grab one today! My Kanken Bag is an authorised retailer of the Kanken bags so you don't need to worry about authenticity.